I am very happy to welcome Award Winning, Historical and Contemporary Romance author Sara Portman to Chicks Rogues and Scandals. So take a seat and let’s get to know a bit about Sara…. Sara Portman is an award-winning author of historical romance. Her debut novel, THE REUNION, was named the 2015 winner in the Historical Category of the Romance Writers of America® Golden Heart® contest. When not reading or dreaming up romantic fiction, Sara works in corporate finance by day and holds a B.B.A. in Accounting from the University of Toledo. As part of her academic experience, Sara spent a semester in London, UK through a study abroad program at Richmond College. Her anglophile tendencies continue today. Frankie Reviews : Hi Sara, Welcome to Chicks, Rogues and Scandals! Thank you for taking the time to chat with me today. Firstly, what five words would you use to describe yourself? Sara : Hello, I’m glad to be here! I would say the five words that would sum me up for a stranger are: introverted, analytical, daydreamer, worrier, and pragmatic. Boy, I sound like a barrel of monkeys, don’t I! Frankie Reviews : LOL! If you could live in any era and place, when and where would it be? And why? Sara: Good question! I would probably live in our current era because I have grown accustomed to things like mobile phones and ibuprofen, but if I could relocate anywhere it would be London. I lived there briefly during college and have been back a few times. I feel oddly at home there, considering I’m a Midwestern girl. Frankie Reviews : That is interesting! Who was your childhood hero? Sara : That is a tough question. I don’t know that I had much of anyone specific that I idolized growing up. In movies and television, I wanted to be that strong girl who kicked a## in the corporate world, like Melanie Griffith in Working Girl. Now I’m in the corporate world and I daydream about chucking it all to write full-time! Frankie Reviews : What is your favourite time of the year? Sara : Undeniably autumn. I love the chill in the air that lets me pull out all my comfy blankets and sweaters and I love returning to all of the cold-weather food, like roasts and soups and stews. Oh, and pumpkin. I love pumpkin everything—bread, pancakes, pie, soup. I’m just not a fan of pumpkin lattes. I can’t get behind those. Frankie Reviews : Oh, that does sound lovely, out of all your work, who is your favourite character and why? Sara : I think Lucy, the heroine in my second novel, is the most like me, but for that reason, I will say Emma, the heroine of my first novel. Emma is willing to say out loud some of the things that I would keep bottled up, or wouldn’t think to say until the moment had passed. (refer to question #1) She doesn’t shy away from a little well-deserved snark on occasion, which is fun. Frankie Reviews: Where does your inspiration for your books come from? Sara : The seed for most of my stories starts as a conversation in my head. It’s just a single conversation—usually the meet cute—and I build from there. I start thinking, why would he be asking her that? Why was she there in the first place? I build the back story to understand how they each got to that moment, that conversation, then take the story forward. Frankie Reviews : What three tips would you pass on to an aspiring author? Sara : #1 Get into a writers’ group. I delayed too long in doing this. Being a member of Romance Writers of America, both nationally and at the chapter level, has been invaluable. The resources and support of this organization cannot be overstated. #2 Get some feedback. I know some of the constructive criticism I received at the beginning was tough to hear, but a lot of it was valid. And the praise that accompanied it was very important in driving me to keep working. #3 Make connections. I don’t necessarily mean networking connections, although that certainly can help. I have made real friendships within the writing community and their support has meant more to my career than I could begin to explain. Authors are super nice. Really. Give us a try. Sara : This is a surprisingly tough question for me because making dinner conversation with three strangers—even interesting strangers—seems a daunting prospect. (Again, refer to question #1). If I were going to get through it, I would need some comic relief. Kate McKinnon could definitely keep me cracking up. I think inviting a book boyfriend sounds like fun too. Matthew Farrell from Judith McNaught’s Paradise is one of my all-time favorite heroes. He’s so alpha, but we know why and we love him for it. Lastly, I’d have to say Queen Elizabeth I. She’d be considered a strong and independent woman by today’s standards. She was certainly a phenomenon in her own time. She’s an inspirational woman and, beyond that, wouldn’t you love to really know how she was as a person? Frankie Reviews : Now that would be an interesting dinner party! Thank you, Sara for taking the time out of your busy schedule to chat with me today, I have just one more cheeky question, just for fun . . . What is your all-time favourite naughty but nice food? Sara : Oh, that’s simple. Cheese. Cheese of any kind. Mild, strong, soft, hard. I could skip all the rest and make every meal a never-ending cheese course. With a baguette, obviously. Frankie Reviews : Mmmm!! Thank you Sara. John needs a wife capable of smoothing his beloved sister’s introduction into society. But though Emma happily grants him his freedom, her fiery beauty and resilient spirit hold him captive. In fact, John has no intention of letting her go. Her fate is now in his hands, but will her heart be safe there? 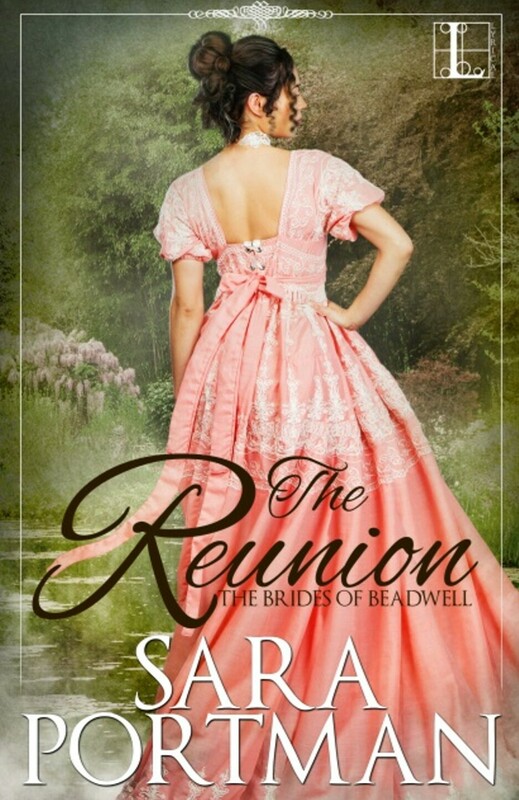 THE REUNION is the winner of the 2015 Golden Heart® Award from Romance Writers of America® More information about the Golden Heart and RWA are available at http://www.rwa.org. Sara accepting her Golden Heart® Award in 2015 with bestselling author Stephanie Laurens and RITA Award winner Meredith Duran. For more information about Sara and her work, then check out the Pink Links below. Sara can be reached at saraportmanauthor@gmail.com or via social media, inquiries should be directed to Meredith Bernstein at Meredith Bernstein Literary Agency, Inc.
Sara is hosting a Giveaway over at Amazon.com, to be in for a chance to win a Kindle Edition of The Girl With The Make-Believe Husband (A Bridgertons Prequel) by Julia Quinn, then click HERE. *Giveaway terms : No Purchase Necessary, Giveaway ends June 5th 2017 at 11:59pm PDT, or when all prizes have been claimed. Open to resident’s of the US only. Official Amazon Giveaway terms can be read HERE. This entry was posted in Exclusives, Give Aways, Interviews and tagged A Chat With. . ., Giveaway, Historical Romance, Interview Exclusive, Sara Portman. I love that you picked Kate McKinnon as someone who you’d love to have dinner with. I’m looking forward to reading your trilogy, Sara!